This map is reproduced on 35 lb heavyweight coated paper for sharper print quality and colors that are vivid. Approximate Image Size. VERY high resolution uncompressed TIFF files. of an Antique Map as detailed below. Sketch F Showing the Progress of the Survey in Section VI. 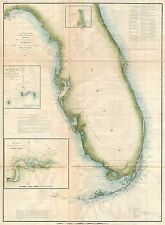 With a General Reconnaissance of the Coast of Florida 1848-55. of an Antique Map. This map is printed on specially coated, matte finish, paper. Sketch Showing the Triangulation & Geographical Positions in Section No. II From New York City to Point Judith. Modern REPRINT. of an Antique Map. Original Map Details. This map is printed on specially coated, matte finish, paper. Map repo master. This map is reproduced on 35 lb heavyweight coated paper for sharper print quality and colors that are vivid. of an Antique Map as detailed below. Approximate Image Size. VERY high resolution uncompressed TIFF files. Of an Antique Map. This map is printed on specially coated, matte finish, paper. Original Map Details. Approximate Image Size. Sub-Sketch Part of Lavaca Bay. of an Antique Map. This map is printed on specially coated, matte finish, paper. Original Map Details. Approximate Image Size. for sharper print quality and colors that are vivid. Preliminary Chart No. 4 of the Sea Coast of the United States from Plymouth Mass. To Saughkonnet River R. I.1857. of an Antique Map. This map is printed on specially coated, matte finish, paper. Original Map Details. 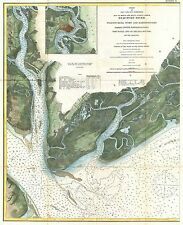 Original 1890s Antique Color Litho Map state of Mississippi w/ Indian Land Cessions, great cond. One light fold as printed, crisp and clean coated paper, lithographed colors by Hoen & Co Lithographers, Baltimore. Indian land cessions United States Smithsonian Institution. Eighteenth annual report. 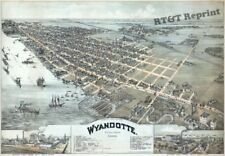 1896-1897. of an Antique Map as detailed below. This map is reproduced on 35 lb heavyweight coated paper for sharper print quality and colors that are vivid. This map is reproduced on 35 lb heavyweight coated paper for sharper print quality and colors that are vivid. Muggletonian Celestial; Planetary Motion Prints. Printed in oil color by G. Baxter, 11, Northampton Square, R., London. Third Edition, 1846. Published by H.S. Tanner. Entered. 1846, by H.S. Tanner. New York. Atlas taken from. of an Antique Map as detailed below. This map is printed on specially coated, matte finish, paper. This map is reproduced on specially coated, matte finish, paper for sharper print quality and colors that are vivid. Approximate Image Size. Miami is shown as Cape Florida Set. A number of old Spanish Land Grants are shown, including Fleming's Grant, Arredordo's first and second grant, Miranda's Grant, Delespine's Grant and Hackley's Lands. Engraved and published by N. & S.S. Jocelyn. New Haven, 1828. Entered. August 1st 1828 by N. & S.S. Jocelyn. Connt. (inset) Profile of the Canals. Chief Engineer. 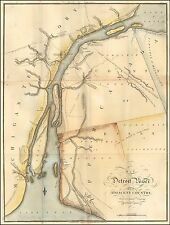 "Showing the canal proposed to run all the way to the Canadian border along the Connecticut River. Of an Antique Map. This map is printed on specially coated, matte finish, paper. Approx image size. Modern REPRINT. Date of Publication 1877. 4th & Cherry Sts. Entered. 1877, by Titus Simmons & Titus. Washington. (view by) A. Ruger, del. Original Title Illustrated atlas of the Upper Ohio River and Valley from Pittsburgh, Pa. to Cincinnati, Ohio. S.S. Burdett, Commissioner. Washington City. Julius Bien, Photolith. This map is reproduced on specially coated, matte finish, paper for sharper print quality and colors that are vivid. These prints are taken from Urania's Mirror; or, a view of the Heavens is a set of 32 astronomical star chart cards, first published in November 1824. They had illustrations based on Alexander Jamieson's A Celestial Atlas. By Alexander Jamieson. 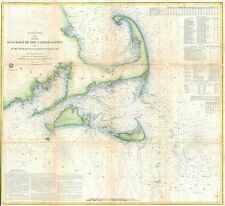 Modern Reproduction of an antique map. This is a hugeCOPY of an original 1855 Map of MISSOURI. Again, this is aCOPY of the huge map,NOT THE ORIGINAL. I have the original and it is not for sale. Of an Antique Map as detailed below. This map is reproduced on 35 lb heavyweight coated paper for sharper print quality and colors that are vivid. From Album Pintoresco de la Isla de Cuba. This Atlas has 27 chromolithograph beautiful prints of Cuba and plan of Havana. I have all 27 available as reprints as well as the title page. MODERN REPRINT. Date of Publication 1877. 4th & Cherry Sts. Entered. 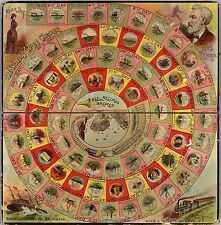 1877, by Titus Simmons & Titus. Washington. (view by) A. Ruger, del. Includes "View on the Ohio River taken from near East Liverpool, embracing parts of Ohio, West Virginia & Pennsylvania, A. Ruger del.". This Atlas has 27 chromolithograph beautiful prints of Cuba and plan of Havana. I have all 27 available as reprints as well as the title page. From Album Pintoresco de la Isla de Cuba. MODERN REPRINT. Originally drawn by Augustus Koch in 1875 and later colorized by Carson City Native Noreen Humphreys. /11mil matte photo paper. This map is reproduced on 35 lb heavyweight coated paper for sharper print quality and colors that are vivid. of an Antique Map as detailed below. Provincetown Harbor Massachusetts.1857. of an Antique Map. This map is printed on specially coated, matte finish, paper. Original Map Details. Approximate Image Size. 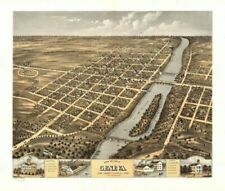 Original Title Illustrated atlas of the Upper Ohio River and Valley from Pittsburgh, Pa. to Cincinnati, Ohio. From United States official and special surveys compiled & drawn for the publishers by E.L. Hayes, assisted by E.F. Hayes, C.M. Beresford, assisted by S.A. Charpiot, F.L. Sanford, J.H. Sherman. By Alexander Jamieson. Printed on HP 35lb heavyweight coated paper. 1892 Map of the. INDIAN and OKLAHOMA TERRITORIES. General Land Office and other sources by. Again, this is aCOPY of the huge map,NOT THE ORIGINAL. I have the original and it is not for sale. RAND, McNALLY & CO Map Publishers. 1861 Map titled SLAVE POPULATION. Again, this is aBlack & White COPY of the huge map,NOT THE ORIGINAL. I have the original and it is not for sale. This map is HUGE! This RARE and UNIQUE map shows the distribution of slaves by each INDIVIDUAL COUNTY based on the census.